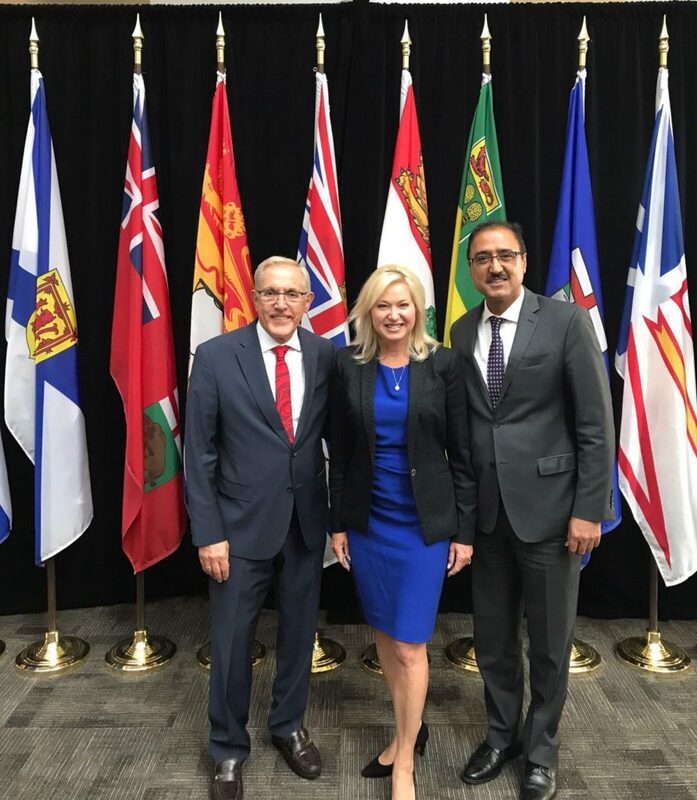 Mayor Crombie with Provincial Infrastructure Minister Bob Chiarelli and Federal Infrastructure and Communities Minister Amarjeet Sohi. “I am pleased to be with you today and to address you on what we believe to be important issues related to the development of this funding program. “I want to begin by thanking my Minister of Infrastructure, Bob Chiarelli, for his and his government’s unprecedented $190 billion in investments in Ontario’s infrastructure. They are already being felt in communities across the province, in particular in my city of Mississauga. “We need both our federal and provincial partners at the table making these important investments because alone, cities are unable to do so – we just don’t have the powers or resources. “Our partnership with the Ontario government is producing results and I know Minister Chiarelli understands the important role cities play in building infrastructure in our province. “We’re ultimately responsible for getting shovels in the ground. “I also want to thank Minister Sohi for his commitments to infrastructure, to Mississauga, and to the entire municipal sector. “There is a new relationship between the federal, provincial and municipal governments that is producing real results for all Canadians. “We are working hard to complete the projects committed to in Phase 1. “Many aspects of Phase 1 were welcome – for example, the transit allocation model, expanded eligible costs, and the recognition of the importance of investing in water and wastewater assets. “In many ways, you recognized the important role cities play and allowed us greater control over project decision-making. “Unfortunately, the “incrementality” requirement that any project be new or pulled forward created some challenges for local governments, particularly when combined with a shorter timeframe. “2018 is approaching quickly! Some projects were brought forward sooner than planned and it created a challenge for us from an accounting perspective. “For instance, in Mississauga, we had to be “creative” in developing our list because of the short timelines and the incrementality rules that didn’t allow us to easily address the priorities on our asset management list. “We’ve committed to buying 77 new buses to improve our fleet, because we were able to meet the timelines and criteria, but it was not necessarily what we would have spent the money on, had we been given greater freedom. “As you know, in Ontario we are mandated to have asset management plans and in Mississauga for instance, we forecast out 10 years on our capital projects. We know what needs to be built and when and we prioritize accordingly. “For instance, Mississauga’s annual infrastructure deficit is now $240 million, despite a 2% infrastructure levy. “It’s important that we are able to build the projects already on our asset management plans before building new, unplanned, unfunded infrastructure. “We are very pleased that the federal government has recognized these challenges and has indicated that it has developed a new approach to tracking the investments that will be made in Phase 2. “In Phase 2, we are looking forward to again working with provinces and territories to make important decisions on how best to target funding – and to ensure that federal funding is enhancing planned provincial and municipal investments. “Along with a clear process for providing up-to-date information to provinces and territories for the required three-year capital plans, this approach to combined investments will help all orders of government deliver needed community infrastructure. “Recognizing that many provinces, including Ontario, and cities like Mississauga have already planned and committed to significant infrastructure investments, it would be helpful to know how we can better assist in the development process of Phase II of the program. “Along with us as Mayors, we also have entire corporations of expert staff who can provide data, information, and feedback on program design and who can be a valuable resource.